Diamond Centers are the places where diamonds go to for grading. These centers are located in Antwerp, London, New York, Tel Aviv, Mumbai and the Far East. The Antwerp World Diamond Center is the major organization of all the centers. It is internationally recognized and the official representative of the diamond sector. Antwerp has been historically linked to diamonds since the 14th century, its commerce is prosperous and lively and it is deeply rooted in history. 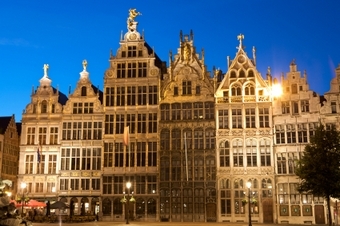 Fore, diamonds are an integral part of Antwerp's cultural from its golden age until this present day. Antwerp diamond center is located in an exclusive, unparalleled infrastructure called, the Antwerp Diamond Square Mile in Belgium. The Square Mile has more than 1500 international diamond companies. It also have four diamond bourses, specialized diamond banks, diamond grading labs, insurance, security and transport companies, brokers, consultants, schools, technology companies and more. The Diamond Centers in New York are located on West 47th Street between Fifth and Sixth Avenues (the Avenue of the Americas), in the Diamond District in midtown Manhattan, within walking distance of many New York attractions. The Diamond District is one block from south of the Rockefeller Center, three blocks south of Radio City Music Hall (along the Avenue of the Americas), three blocks south of St. Patrick's Cathedral (along Fifth Avenue) and one block east of the Broadway Theatre District. In 1941, the Diamond District was created when dealers moved north from another district near Canal Street and the Bowery (created in the 1920s), and from a second district located in the Financial District, near the intersection of Fulton and Nassau Streets, (created in 1931). The district became important when the German Nazis invaded the Netherlands and Belgium. The invasion forced the Orthodox Jews into the diamond business to run away from Antwerp and Amsterdam to New York City, where most of them remained after World War II, and remained a dominant influence in the Diamond District. 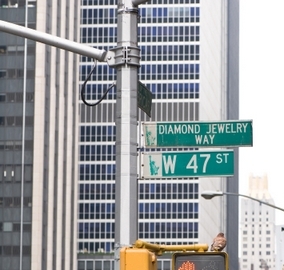 This district in New York City is one of the primary centers of the global diamond industry. Also, it is the premier center for jewelry shopping in the city. In London, the Diamond District have recommended Jewellers with shops that makes your visit a pleasure and a fabulous way to spend cash for your investments, buying jewelry for an outfit or looking for engagement rings for your special wedding day. In these shops, you'll find diamond jewelry from classic jewelry designs to cutting edge pieces by fashion designers. These top London Jewelers lead the way when it comes to incredible jewelry designs. They offer a range of pieces from costume to vintage for every budget. London's Diamond District is located around the area called, Hatton Garden. Since medieval times, Hatton Garden has been London's jewelry trade centre and has developed an international reputation as one of the world's finest and renowned centre for jewelers and jewelry. There's nearly 300 businesses in Hatton Garden are jewelers and there are over 55 shops representing the largest group of jewelry retailers in the United Kingdom. Tel Aviv is one of the most technologically advanced diamond cutting centers and exports around $4 billion worth of polished fancy cut diamonds. The majority of fancy cut diamonds from Israel go to the U.S. markets. The Diamond Center in Tel Aviv was started after World War II when the Jews fled from Holland and Belgium to settle there. 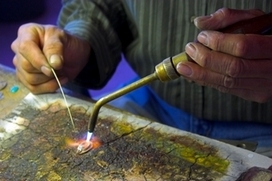 They were skilled diamond cutters, who gained the top position for cutting large diamonds and fancy, unique cuts, before then, the production of Israel's cutting was of small melee diamonds. Israel's Diamond Center is in Ramat Gan. The Center offers free tours of Tel Aviv, a one-hour walk around the Old City of Jaffa, and visitors are driven by the major sites in the city. Other sites in the city are the Dizengoff Center, the Mann Auditorium and the Tel Aviv Art Museum. The Oppenheimer Diamond Museum in Ramat Gan is the last stop on the tour, afterwards visitors can make purchases in a diamond showroom at huge discounts. Mumbai is the export center and Surat is the production center for diamonds. Mumbai in the export of diamonds is the gateway and is famous all over the world largely because its cheaper than other places and its quality is superb. There are many diamond showrooms in Mumbai, India that attracts customers from around the world.